An ex-England International who spent eleven years at Millwall, Smith was with the Royal Air Force during the second World War when he was posted to Leuchars in 1944. During his time in Fife, he appeared as a guest player for Dundee and when the war was over he signed on at Dens Park on a permanent deal. 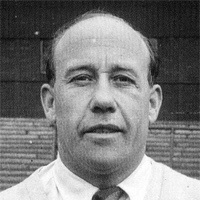 It was with Dundee where Smith took up a coaching position after a brief spell as Corby Town manager, and in September 1954 Dundee United chose Smith to replace the departed Willie MacFadyen. In his first season he managed to keep United off the bottom of the Division Two table, and followed that up with a respectable 8th place in 1955/56. Midway through his third season, Smith resigned to take over Division One club Falkirk, who he lead to Scottish Cup glory just a few months later.